Tourism Saskatchewan has always been on the forefront of awesomeness, with innovative live chat, video, and promotions, but they outdid themselves with the release of their mobile website. Rather than copying their existing website, Tourism Saskatchewan went for a mobile-specific site that only gives the key tourism information. Users can access detailed information by choosing a community or park, finding an event or contacting a travel counsellor. Or, they can choose the highway they’re on and view upcoming attractions. Saskatchewan is criss-crossed by two major highways, Highway 1 (Trans-Canada) and Highway 16 (Yellowhead), and every summer thousands upon thousands of people drive across the province. And by “drive across” I mean “drive across”— they tend not to stop, except for gas and maybe to gamble in North Battleford. Saskatchewan has long been treated as an irritating strip of wheat that takes forever to drive across. But what many travelers don’t know is that the province is actually a worthwhile place to spend time in. Tourism Saskatchewan is well aware of this fact, so to help spread the word of Saskatchewan’s tourism nuggets, they turned to QR codes. They placed posters containing these codes in information centres, popular attractions and gas stations along the two major routes. When scanned, the QR codes link to a mobile-optimized page on the Tourism Saskatchewan site with information relating to the surrounding area, such as hours of operation, contact information, street addresses, etc. For those who aren’t experienced with QR codes, the posters contain advice on how to download a scanner. Tourism Saskatchewan also promoted the mobile site through a series of well-documented road trips. They sent a correspondent, Becky, her dog, Rocco, and her mobile phone (nameless) to various locations around the province. She shared her adventures with Facebook, Twitter and YouTube and asked for advice about where they should stop or eat along the way. As far as provincial tourism websites go, Saskatchewan was the first to release a mobile site. To check it out, go to www.sasktourism.com. 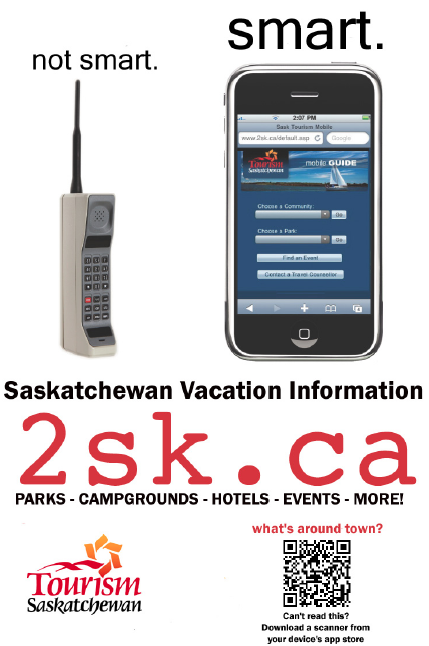 If you’re on a mobile phone, you’ll automatically be transferred to their mobile site (www.2sk.ca).